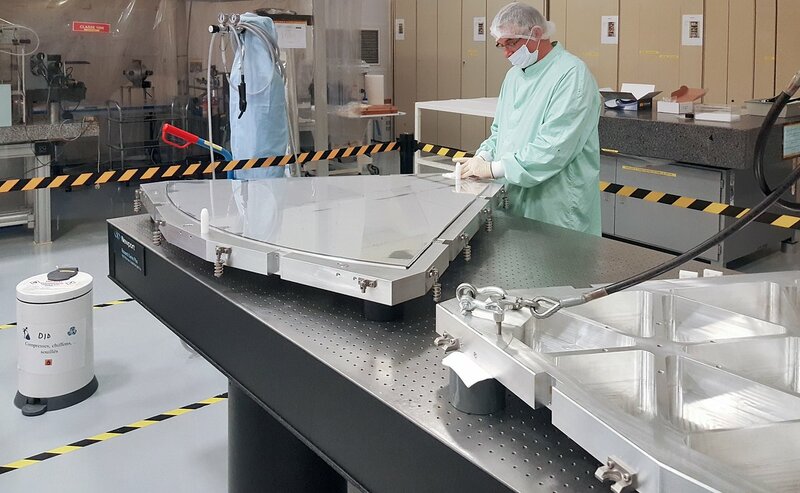 The French optics company Safran Reosc has completed the first of six shells that will comprise the M4 deformable mirror system, which forms a fundamental part of ESO’s Extremely Large Telescope (ELT). When complete, the adaptive M4 mirror will be 2.4 metres in diameter but only 1.95 millimetres thick. This very thin mirror is one of the five main mirrors of the ELT’s optical system, with the main segmented mirror being 39 metres in diameter. Safran Reosc are manufacturing all six of the deformable shell mirrors that comprise the M4 mirror. Together, these 60-degree petal sections form the circular segmented M4 mirror. They will be mounted and supported in the adaptive mirror unit. Meanwhile, the Italian consortium AdOptica is manufacturing the complex adaptive support system needed for the M4. Deformable mirrors, such as the M4 mirror of the ELT, are key components of adaptive optics systems, which help reduce the effects of atmospheric distortions. Adaptive optics systems work by measuring atmospheric turbulence — often with the help of laser guide stars — and compensating for this turbulence by adjusting the shape of a deformable mirror. The actuators and controls in the adaptive support system will allow the ELT to make these corrections in real time. The system will also be able to correct for effects caused by the wind, which can sometimes deform the structure of the main telescope. The combination of the M4 mirror shells and their adaptive support systems will form part of the largest adaptive mirror unit ever made and means that images obtained by the ELT will be almost as sharp as those taken in space.